The fire was contained to one room and several other patients are now being treated for injuries. AN ELDERLY MAN has died following a fire on Christmas Eve morning that broke out at a hospital on Dublin’s southside. The man, who was in his 80s, passed away from injuries sustained in the fire which started at approximately 5:30am on 24 December at a ward at St. Luke’s Hospital in Rathgar, Dublin 6. According to the HSE, the fire was contained to one room and several patients are now being treated for injuries. 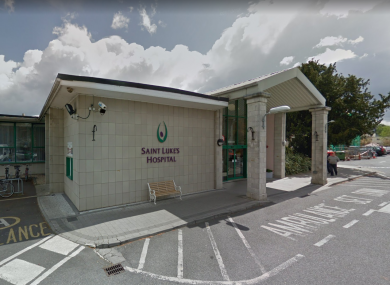 “As a result of the incident, three individuals were transferred to St James’s Hospital and two individuals were transferred to St Vincent’s Hospital for treatment,” the HSE has said in a statement. An Garda Síochána are now investigating the fire, which is not believed to be suspicious at this time, and health watchdog HIQA has been notified of the incident, according to a spokesperson. Email “Man in his 80s dies from injuries sustained in Christmas Eve hospital fire”. Feedback on “Man in his 80s dies from injuries sustained in Christmas Eve hospital fire”.